Due to the fact that BioLingus' drug administration is sublingual and our use of a specific carrier molecule, the BioLingus technology is particularly effective for sublingual immunotherapy (SLIT). SLIT has been used by others to treat allergies, as described in the following patient oriented video from the John Hopkins University. 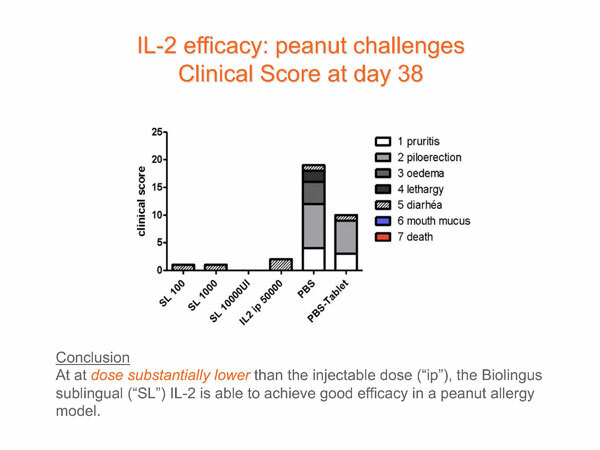 Using low dose SL IL-2 in a peanut allergy model demonstrated that our sublingual therapy is as effective as injected IL-2, but at a dose which is 500 times lower. We believe that the reason for this is that our SLIT technology brings the molecules effectively to the lymphatic system, and thus directly to the immune system itself. BioLingus has a project to develop low dose IL-2 for treatment of early onset juvenile Type I diabetes. Low dose IL-2 in animal models has shown to balance Treg and Teff immune cells to reverse or prevent type I diabetes. Especially in children, having an oral therapy will make a difference.